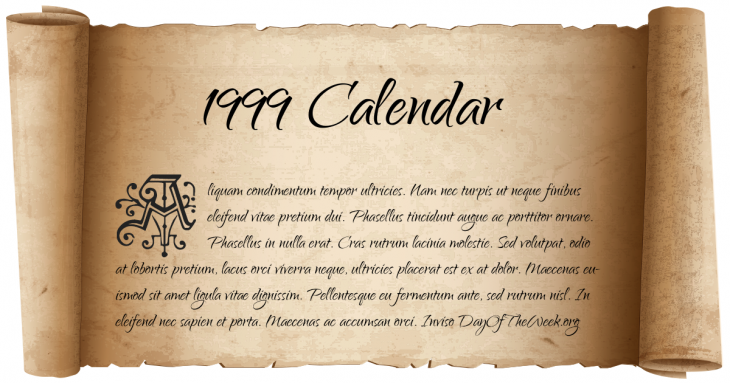 February 16, 1999 – New Year’s Day in Chinese calendar. Start of the year of the Earth Rabbit in Chinese astrology. February 23, 1999 – An avalanche destroys the Austrian village of Galtür, killing 31. March 21, 1999 – Bertrand Piccard and Brian Jones become the first to circumnavigate the Earth in a hot air balloon. April 7, 1999 – The World Trade Organization rules in favor of the United States in its long-running trade dispute with the European Union over bananas. June 12, 1999 – Kosovo War: Operation Joint Guardian begins when a NATO-led United Nations peacekeeping force (KFor) enters the province of Kosovo in Federal Republic of Yugoslavia. July 31, 1999 – Discovery Program: Lunar Prospector – NASA intentionally crashes the spacecraft into the Moon, thus ending its mission to detect frozen water on the moon’s surface. September 14, 1999 – Kiribati, Nauru and Tonga join the United Nations. October 27, 1999 – Gunmen open fire in the Armenian Parliament, killing Prime Minister Vazgen Sargsyan, Parliament Chairman Karen Demirchyan, and 6 other members. November 19, 1999 – Shenzhou 1: The People’s Republic of China launches its first Shenzhou spacecraft. December 26, 1999 – The storm Lothar sweeps across Central Europe, killing 137 and causing US$1.3 billion in damage. Who Were Born On 1999?